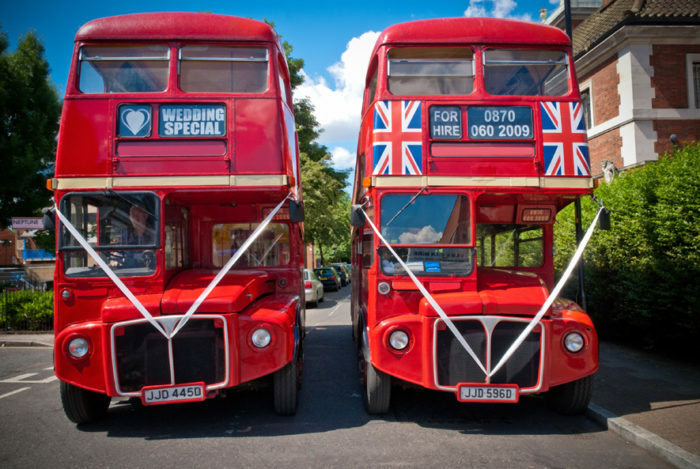 Choose from our fabulous range of wedding buses. We have years of experience providing a professional, friendly and reliable service, making us the number one choice for your wedding bus hire. Relax on your big day as we expertly manage all of your guests’ transport logistics, to and from the event. Let us pamper them as they travel in style on board one of our luxury executive coaches or delight them with a trip in a double decker, London bus . We have years of experience organising wedding day transport for groups of all sizes and will happily advise on the best arrangements for your particular requirements. You can rely on us to be punctual, and get your guests from A to B, happy and stress-free. Contact us at Hireyourtransport.com to discuss your options, and receive a free no obligation quote on your wedding bus hire. We pride ourselves in providing a friendly and flexible service, doing what we can to accommodate your individual needs when it comes to hiring group transport for your wedding. Our drivers can be relied upon to deliver a brilliant service with a smile. We aim to make your wedding day as wonderful and memorable as it can possibly be. Travelling to your wedding by bus or coach is a great way to get your guests chatting among themselves either on the way to the church or between church and the reception. And you won’t need to worry about guests getting lost on the way or struggling to find somewhere to park, we will look after them all and deliver them promptly, in style. Please book your wedding bus hire as soon as you can. We have lots of buses and coaches, but we also do lots of weddings, so please contact us early on to explore your options. Bank holidays and summer weekends are particularly popular times so the sooner you can call us the better.